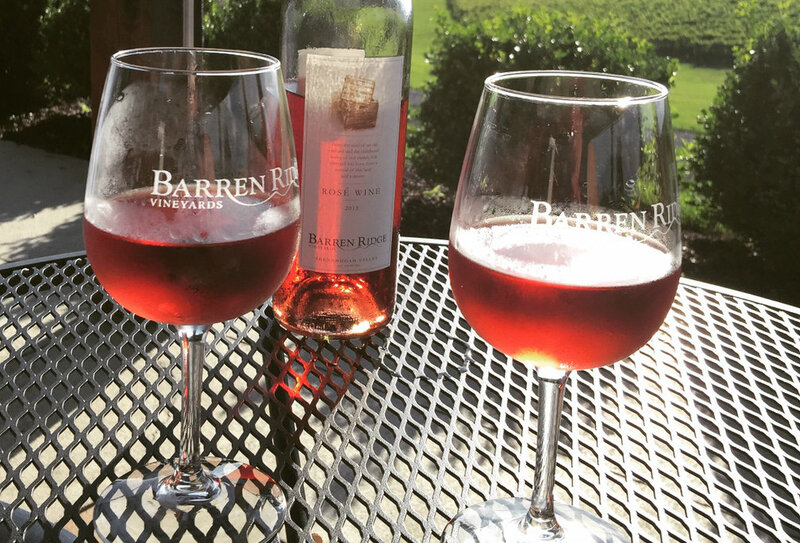 Rose is perfect for the summer at Barren Ridge. Photo: Girl Goes Virginia. Though I’ve been to a little over 20 Virginia wineries now, and tried about 20 more Virginia wines than that, Barren Ridge remains close to my heart, in all probability, for being so close to my home. But judging Barren Ridge on proximity alone just wouldn’t be fair. It really is a wonderfully appointed Virginia winery, with stunning views in a quiet setting that offers as much atmosphere in the winter as the temperate seasons. And their wine is fabulous. Because Barren Ridge is less than ten miles away from us, my hubby and I go there pretty regularly. Picking up our Crush Club package of three wines every quarter is reason enough to get us over there. And that usually comes with a club pot luck and the occasional entertainment — live music or a meet the winemaker event. But Barren Ridge remains a go-to spot when we feel like cutting out of work early on random days (perks of working for yourself) and just spending the afternoon before their formidable fireplace or watching the sun set from the gorgeous two-story patio. One benefit of being in the slower Shenandoah Valley is that this winery, while often bustling, rarely suffers from such a massive onslaught of visitors that it’s no longer pleasant to be there. They usually hit the sweet spot from it being just a few couples or parties to being busy without being oppressive. The name Barren Ridge is apparently historical, and refers to weather patterns that keep their little slice of paradise both drier and more breezy, a perfect setting for vineyards. And the winery represents the continuation — actually the revitalization — of agriculture in owner John Higg’s family. Formerly an apple orchard, Higgs transformed the defunct orchards into fields for grapes to grow, but saved essential features from the apple barn such as its wooden beams and frame, while adding to it an enormous fireplace, and using reclaimed wood throughout. As for the wines themselves, you’ll have to understand that I’m no Niles Crane — I’ll never be the corkmaster at a hoity-toity wine club. I love wine, and actually do finally taste the subtleties when something has, “hints of currant,” or a “chocolate finish” or “peach on the nose.” But I’m not yet ready to wax on about it in my writing as if I’m a true proficient. Not yet. I’m more apt to point out whether a given place’s wines taste good, and the winery is worth a visit for the whole vineyard and tasting room experience. When something is tacky, watch out — me no likey ugly stuffand I’m apt to say it. But if the general experience and wines are nice, then I’ll tune in to what you can expect when you visit and share that. If you want more precise wine information than that, you should check out the blogs Wine About Virginia, and The Virginia Grape. And, in honor of Barren Ridge’s own Rascal, I should mention the Virginia Wine Dogs Blog, too. There’s likely a few others, too. As for me, my favorite wines from Barren Ridge are their Touriga and the Meritage, though lately I’ve been having the Rosé for its cool crispness on hot days on the patio. It’s not as entirely dry as I like in a Rosé, but semi-dry and that’s fine. Over the years I’ve also picked up their dessert Christof more than a few times as gifts — beautiful bottle, smooth and round sweet wine. Barren Ridge was the first winery in the Shenandoah Valley and we’re lucky for it. As a gateway to America’s original breadbasket, I can think of no better stop for those coming over the mountain from Charlottesville than to try Barren Ridge first. And if you’re coming up or down I81, it’s just about eight miles or so to the vineyard via I64 East (get off in Fishersville). Its gracious setting, and artfully crafted wines will make you curious about what else this ancient and mysterious Valley has to offer. In fact, it will set the standard.